On a recent Saturday evening out with another couple, we finally tried a place that I’ve been meaning to get to for at least a year, Goin’ Coastal Seafood, in Virginia-Highlands. We’d seen it on frequent visits to Paolo’s. One of my friends kept telling me I had to go. So, this week, when we discussed weekend plans, we made a reservation and headed in for dinner. It was an odd evening because there was a threat of a snow storm – we even saw a few flakes as we walked from our car to the front door of the restaurant. Traffic was light on the roads. Foot traffic was light in the Highlands. 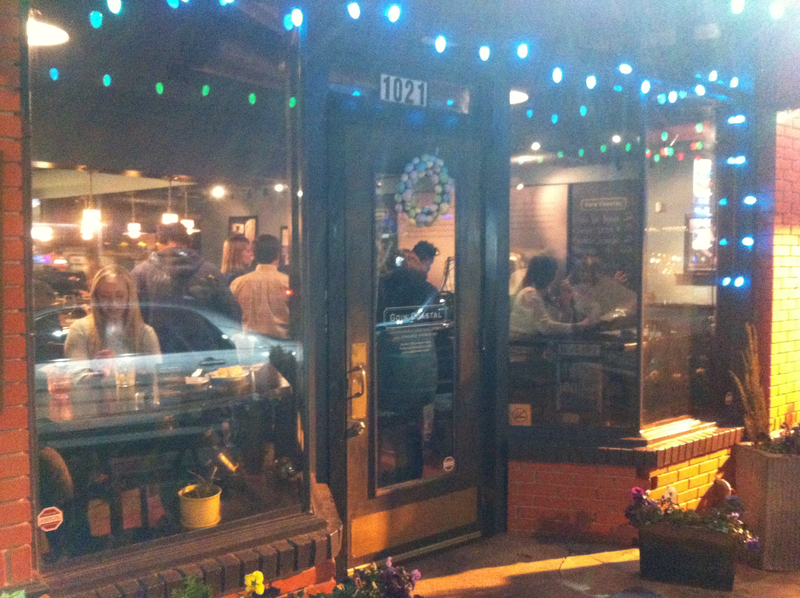 And the restaurant wasn’t overly crowded, a rarity for most places at 6:00 on a Saturday pre-spring. Shortly after we were seated, a plate of cornbread and butter arrived. Let me start off by saying that I’m not a cornbread aficionado. 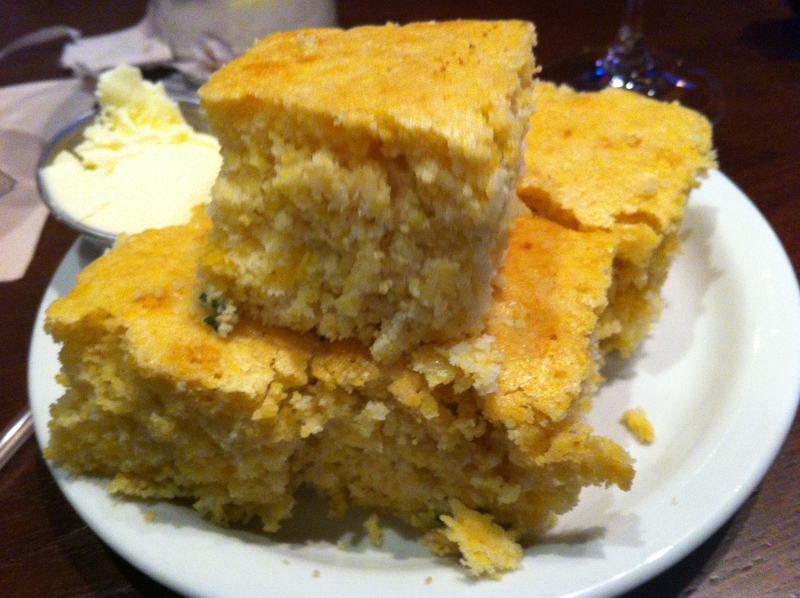 In fact, my favorite cornbread in the world was in elementary school and I’m sure it was made from a mix. It was yellow and sweet. Just like the cornbread sitting in front of us. This meal was off to a good start. Then we met our waitress, who was exceptional. Thorough. Personable. Conversational. 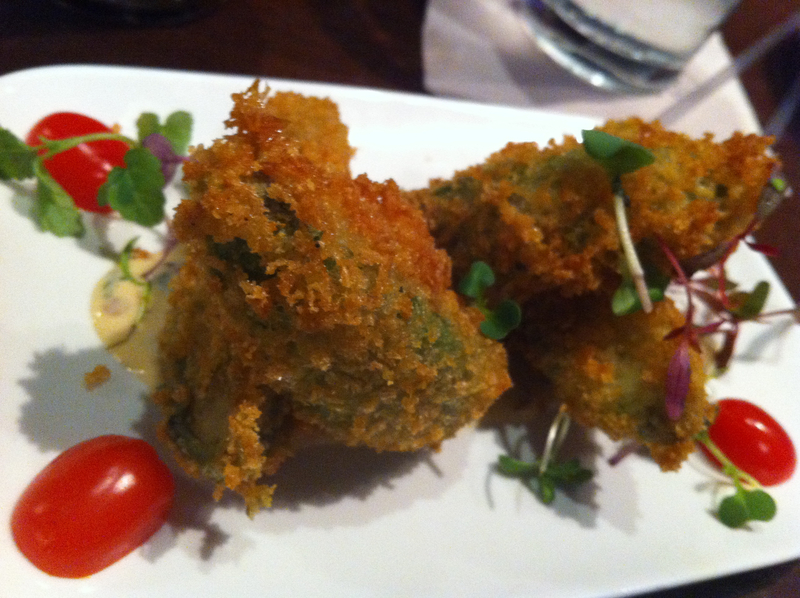 She told us about the daily specials and we started with one of them – fried green tomatoes. They were a hit. Perhaps the pending snow storm kept the crowd light, as there were empty tables all around, but it allowed the waitress time to spend a little time with visiting with us. We actually had one of the most leisurely dinners I can recall, enjoying the conversation as we ate. 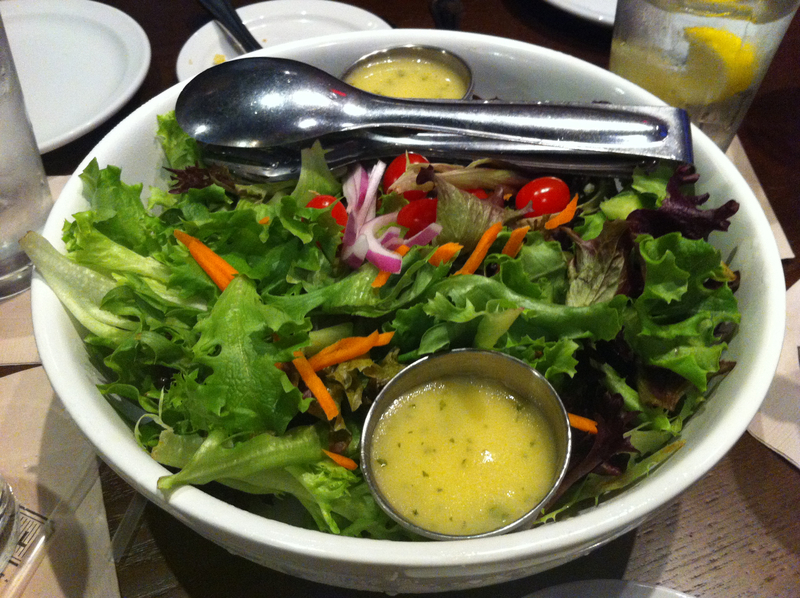 We ordered a garden salad for the table. 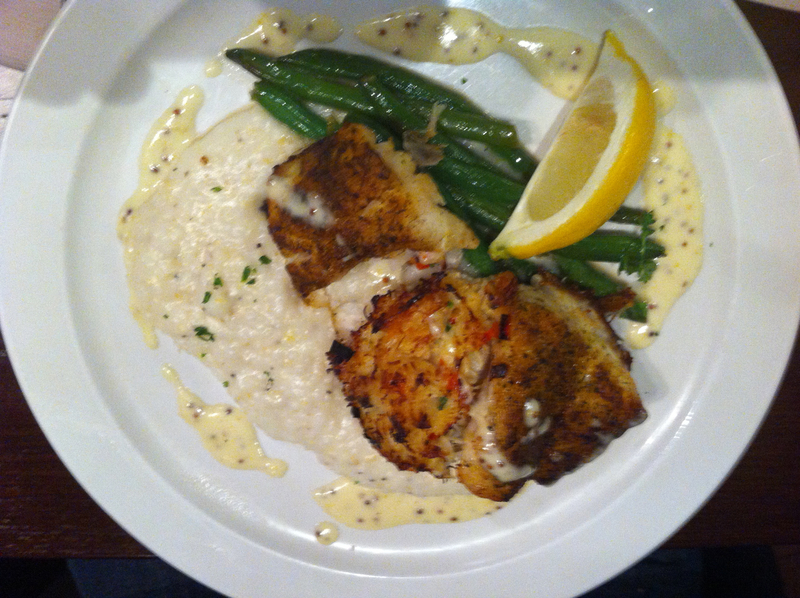 My dear one ordered one of the daily fish specials, served Coastal style (vegetable medley with whipped potatoes and a buerre blanc sauce). She offered a bite, which was quite tasty. I ordered the shrimp and grits, which were one of the most different presentations of this dish that I’ve encountered. The shrimp were sauteed and served over creamy cheese grits with andouille gravy, with two more shrimp, flash-fried and sitting atop it. 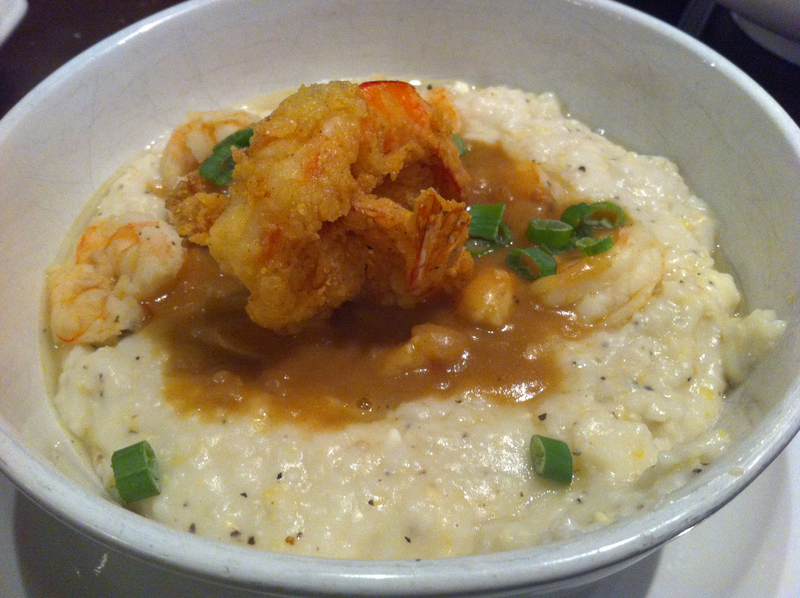 The gravy on the cheese grits was exceptional, as good as I’ve had and the flash-fried shrimp on the top were among the best shrimp I’ve ever had. An outstanding dish. 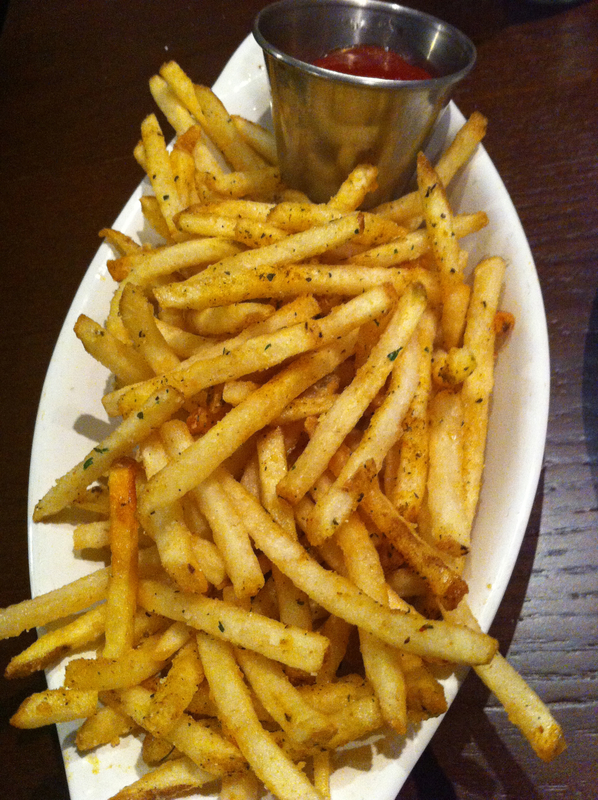 When I complemented it with a humongous side of french fries, my hunger was sated. After dinner they offered dessert but nothing sounded particularly good, except for a plum bread pudding that wasn’t really an option. I’m not sure what the waitress said, but I heard plum bread pudding and my mind was set on it. I’ve never had it. Never heard of it. But doesn’t it sound good? We debated with the waitress whether we could pay her to run next door and get gelato for us and bring it back. She was actually willing. I honestly believe that she would have done so. It was great night out. And, by the way, the thirty-seven snow flakes that fell on us on the walk over were the extent of this early March storm.